You can easily mount the Tornado manual wheatgrass juicer to any countertop. 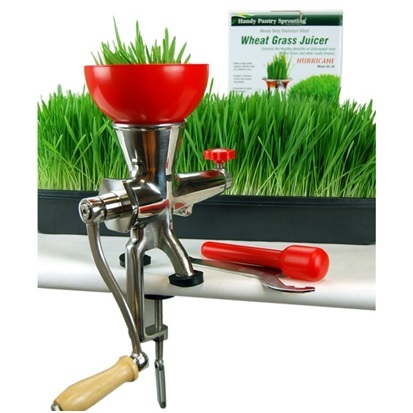 It is a versatile juicer designed specifically to juice wheatgrass, barleygrass. It will extract juice from most other fruits and vegetables, though not as efficiently as grasses. It doesn't juice carrots and other hard vegetables well unless they are pre-shredded. It is an efficient juicer that ejects grass pulp that is quite dry. Set-up and Clean-up are fast and easy, and the Tornado is dishwasher safe. We have found this juicer to be great for those just getting started. If you are going to be juicing wheatgrass for 1 or 2 people it is fast and ideal.